Ufology today is riddled with religiosity. Most UFO conferences and conventions boast slates of lecturers on spiritual contact with aliens, telepathic communication across the galaxy, healing with crystals, and how to "raise consciousness." It's a long way from the "nuts-and-bolts" ufology that was prevalent in the 1960s. Back then, it was assumed by many UFO buffs that aliens were piloting what was being reported as flying saucers, and that these were physical craft engineered by highly advanced humanoid creatures from other planets. Some believed that aliens were working in collusion or through the assistance of terrestrial governments, usually the United Stares. Before this, in the 1950s, contactees were popular among saucer fans. Conventions such as the one at Giant Rock attracted many people willing to shell out to hear others tell of their trips to Venus and Mars aboard alien craft. This was the time of early ufozines and books by authors such as Adamski, Menger and Williamson. It was all very campy and silly, but admittedly fun. Following the decade or so of nuts-and-bolts ufology, the 70s and 80s brought with them a resurgence of contactees, with a twist. Now, aliens were not the usual friendly and benevolent visitors, but had intrusive agendas that involved medical examinations and probing of powerless humans. Since then, "hard science" ufology has been relegated to the back seat, and populist ufology almost always has a core of mysticism and "New-Age" beliefs. It's ironic, as UFO groups such as MUFON are trying to rebrand as more scientific organizations, all of this at a time when metamodernism is dictating that a more religious version of ufology is surging in popularity. This week is the 50th anniversary of some of the most remarkable "nuts-and-bolts" UFO cases on record. The Shag Harbour UFO Crash off Nova Scotia is considered an example of an actual physical craft plunging from the sky into the ocean, without any suggestion of consciousness-raising by any aliens on board. 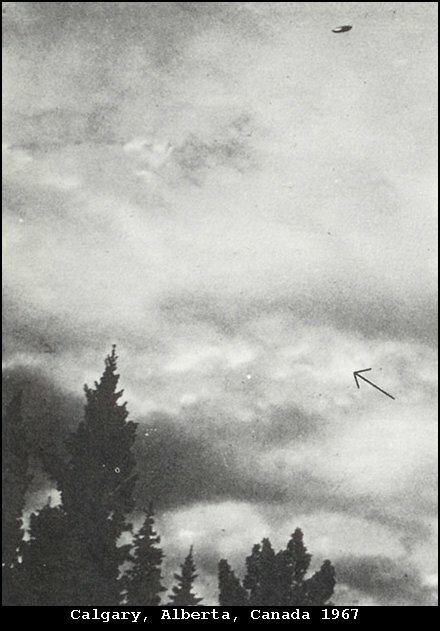 The Calgary UFO photo was widely considered "the best daylight UFO photo ever taken." And then there's the Falcon Lake case. Stefan Michalak was physically burned by something in a forested area of the Canadian Shield. It was investigated by civilian UFO groups as well as the RCMP, Canadian Air Force, and even a subject of a visit by investigators from the USAF-funded Condon Report. The incident was investigated and treated as an encounter with a physical craft. One of the most celebrated Manitoba UFO witnesses is Stefan Michalak. He was given a barrage of psychological tests at the prestigious Mayo Clinic in the United States and found to be in excellent psychological health, despite his claims of contact with a physical craft of unknown origin and the hearing of strange voices emanating from within. Michalak was neither a contactee nor an abductee, as he did not claim any direct contact with aliens. His opinion, in fact, was that he was a victim of an accident during a test of an American secret aircraft. However, a contactee group called Mark-Age claimed it had additional knowledge about Michalak’s experience. Very similar to the groups which today receive channelled messages from “Space Brothers” as part of their so called New Age teachings, Mark Age’s purpose is to warn mankind of the coming end-time, and to encourage the spiritual “tuning in” of our civilization (if that were possible). The group published books and newsletters relating information channelled to its members from the “Space Brothers,” commenting on everything from politics to scientific developments. ...he must get assistance... to counteract the radiation exposure. First of all, he should burn or bury all clothing and metal objects which he had when in contact with the ship, and within a radius of four kilometers then. These retain the vibrational force emitted from the ship at the time of departure; which was an emergency plan, and not our usual exhaust. Source: Mark-Age (1974). Visitors from other planets. Miami: Mark-Age. Inc. So, even though there was never any hint that Michalak had encountered consciousness-raising aliens, at least one contactee group couldn't resist latching onto the case's popularity to push its agenda.